Hello guest. Manstoc come back again with news information about HP product. HP has been release HP Slate 7 tablet. Sound bigger than it looks. What you see is what you share. Artfully android because powered by Android and you can explore of music, apps, movies, and more on this tablet. Sound bigger than it looks because HP Slate 7 tablet has design from Beats Audio so this tablet can has big sound but small size. What you see is what you share because HP Slate 7 tablet equipped with rear or front cameras (See your world through two new share). HP Slate 7 tablet has design 7-inch screen with a silver metal spine encloses its entire body, on the bottom edge HP Slate 7 tablet has a Micro- USB port flanked by a narrow speaker grille on each side. The top edge sees a headphone jack, microphone pinhole, and miroSD slot gathered on the left, with the power/sleep button on the right. Along the right edge is a slightly concave volume rocker. A silver embossed HP logo graces the gray rubberized back side, and in the top-left corner sits a 3-megapixels camera, sans LED flash. At the top of the bezel is a low-quality VGA front-facing camera. Processor : ARM Cortex-A9 Dual-Core (1.6 GHz). Memory : 1GB DDR3 SDRAM. Iternal Storage : 8 GB eMMC SSD. See HP Slate 7 tablet specs more clearly (HP Slate 7 tablet). See HP Slate 7 tablet features more clearly (HP Slate 7 tablet). 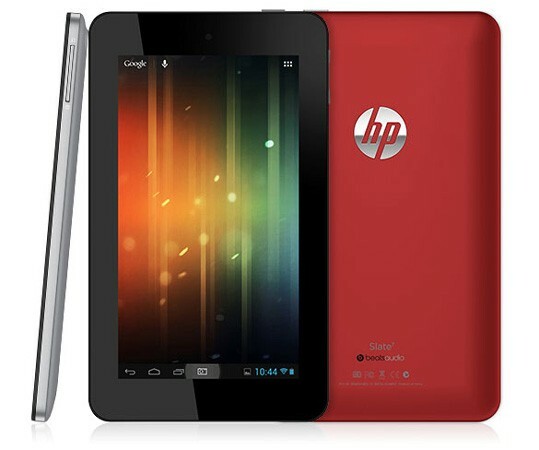 Buy HP Slate 7 tablet now in here (HP Slate 7 tablet). Learn more HP Slate 7 tablet with download HP Slate 7 tablet user manual in below and fun life with your HP Slate 7 tablet. Hopefully useful to user HP Slate 7 tablet. If you like thus article or you find problem in this article you can comment below.